The Bolo Tie lies somewhere between necklace and necktie with a definite Southwest flair to it. The Bolo is popping up in fashion shows around the world and worn by women nearly as much as men. Richard began working in metal in 1969 as an assistant to metal sculptor Malcom Moran in Carmel, CA. He went on to graduate from the University of California and became a teacher in the California Public School System. After 32 he retired from teaching to devote more time to his art and teaching workshops around the country. 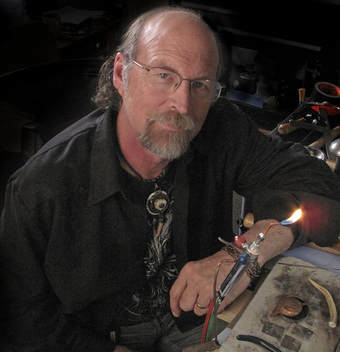 He considers himself not so much a jeweler but rather a ‘maker of wearable art’. His interests include digital art, mixed media collage/assemblage, sculpture and jewelry. Richard's work has been featured in ‘Belle Armoire Jewelry’, 'Art Jewelry' and ‘Jewelry Artist’ magazines. Other published work can be seen in Susan Lenart-Kazmer’s book ‘Making Connections’, ‘Steel Wire Jewelry' by Brenda Schweder, 'Steampunk Style Jewelry' by Jean Campbell and 'Metal Style' by Karen Dougherty. Richard and his wife, Jane, reside in Rio Vista, CA. Bring a flat-backed cabochon of your choosing that will fit on a 2” x 2” base with sufficient room left around the stone for embellishments. If you want to do a stone-on-stone setting, bring a second smaller cabochon for that. I will have some stones also if you don't have one to bring.